Look around any Irish city, town or village and you will find something that makes it unique: The shopfronts. With the exception of chain stores, each Irish shopfront is different. The beauty of these pieces of commercial art is that on closer inspection you will see beautifully hand crafted details which include carpentry, carved mouldings and corbels, hand painted signage, painted carved block letters, etched glass and tiling. Irish shopfronts often consist of classical design elements such as hand carved corbels, columns and cornicing. The shopfront is usually harmonious in style, proportion and scale to the building where it sits. Each one tells us a story, of a business still trading after generations or of one consigned to dusty history, alive only in the memories of the local families it served and the tradesmen and artists who worked together to create it. Seeing one of these old, disused shopfronts gives us a unique insight into previous generations. Irish shop fronts, by their very nature are colourful, charming and utterly unique and this has been reflected in the number of books, posters and postcards featuring them. While a great many have disappeared, lots have been preserved and restored, physically, or recorded on film, in books and on posters for future generations to appreciate. 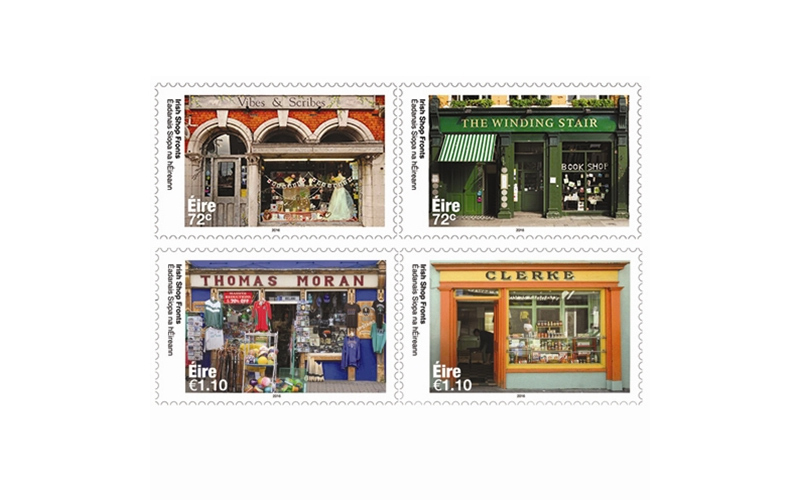 In celebration of Ireland’s magnificent collection of local shopfronts, Ger Garland has designed four new stamps, featuring the following shops: Thomas Moran (Souvenir Shop), Westport, Co Mayo; The Winding Stair (Book Shop), Dublin City centre; Vibes & Scribes (Arts & Hobby Shop), Cork City; and Clerke (Grocer), Skibbereen, Co Cork.